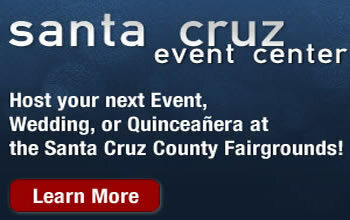 Watsonville, CA - There is nothing quite like Fairtime at a Fairgrounds. The Santa Cruz County Fair is no exception and you can feel the vibe as hundreds of volunteers work to be ready for opening day. "In the past we’ve been kind of low key about opening the gates” said Dave Kegebein, Fair Manager, who added, "This year we want to add a little more excitement to our ceremony." Fair Board of Director member Stephanie Fontana volunteered to organize the festivities. “Many of our colorful Fair performers will be at the main gate to entertain our early arriving guests prior to the start of the ceremony. Then Ted Sanchez will sing the Star Spangled Banner, we’ll have a proper salute by an honor guard, and opening remarks by Don Dietrich, Board President” Fontana outlined. The gates will then swing open at noon on the much anticipated fully packed five day Fair.